The 8th International Congress of Psoriasis from Gene to Clinic is taking place in London from Thursday 30th November to Saturday 2nd December. 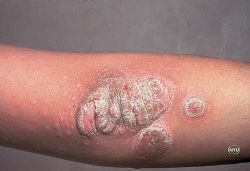 Clearance of chronic psoriasis after eradication therapy for Helicobacter pylori infection. Has the Cause of Psoriasis Been Found? It is evident that the disease burden of psoriasis extends beyond the physical symptoms experienced by the patient, reasoned Dr Zarnaz. In psoriasis, the immune system mistakenly starts attacking healthy skin cells, accelerating the process and causing the dead skin cells to rapidly build up on the skin's surface, giving it a raised, scaly, itchy, dry, and red appearance. 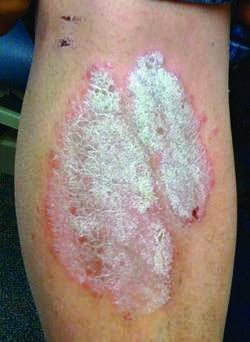 The stories on psoriasis in this year's supplement reflect the advances in our understanding of psoriasis that have led to more directed therapies and increased knowledge of associated inflammatory conditions. 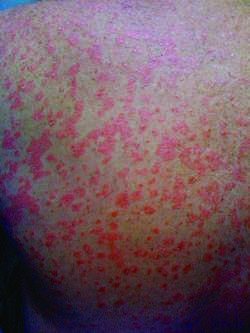 He emphasized that psoriasis is not caused or worsened by poor personal hygiene. According to the company, the Corrona Psoriasis Registry is the largest, independent US registry of psoriasis patients. Hypertension which is a predictor of cardiovascular disease may be related to the increased levels of angiotensin-converting enzyme, endothelin-1(ET-1) and renin in patients with psoriasis,7 whereas increased insulin resistance is due to TNF-a which plays a central role in the immune-pathogenesis of psoriasis. Most people develop psoriasis first and are later diagnosed with psoriatic arthritis, but the joint problems can sometimes begin before skin lesions appear. Develop business strategies by understanding the trends shaping and driving the global psoriasis market. Moderate and severe psoriasis increased risk of cardiovascular disease by 39 percent and 81 percent, respectively. Identify and understand important and diverse types of therapeutics under development for Plaque Psoriasis (Psoriasis Vulgaris).